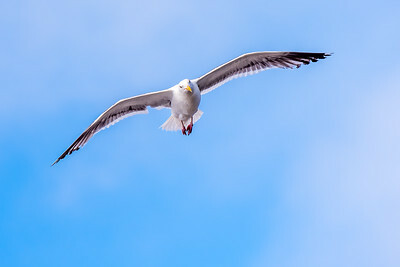 Seascapes, beaches, oceans, lighthouses, and nautical scenery. Cape Argo Lighthouse off of Shore Acres State Park, Oregon. 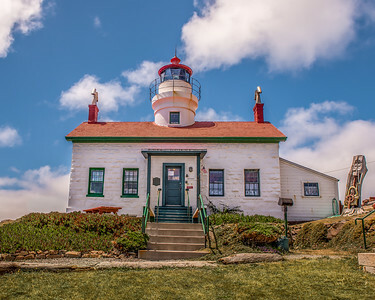 1856 Battery Point Lighthouse, off Crescent City, California. 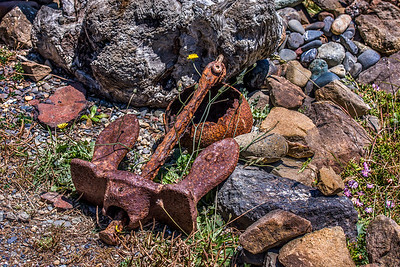 Rusted Sea Anchor at Battery Point Lighthouse, Crescent City, California. 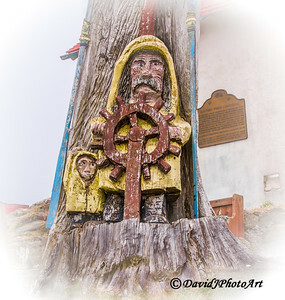 "Someday I'll Be At The Helm"
Old redwood carving of fisherman and son in raincoats at ships wheel. 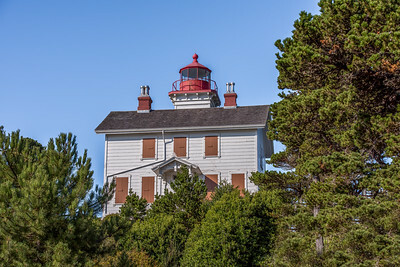 Battery Point Lighthouse, off Crescent City, California. 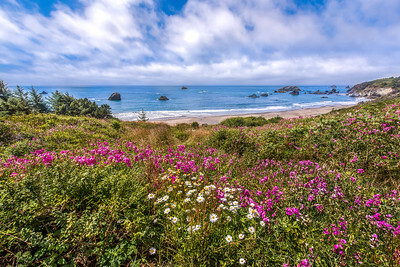 Wildflowers growing on the cliffs overlooking the beach at Brookings, Oregon. Rainbow Rock and cove, Oregon coast, Oregon. 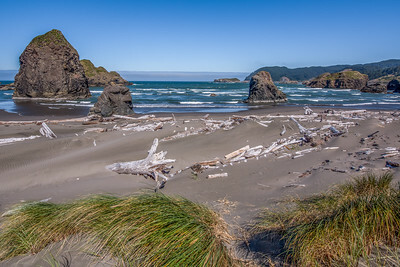 Driftwood and Dunes at Pistol River Beach, Oregon. 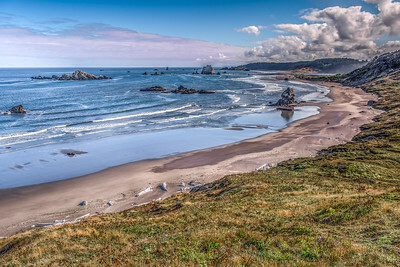 Rocky shores at Pistol River Beach, Oregon. 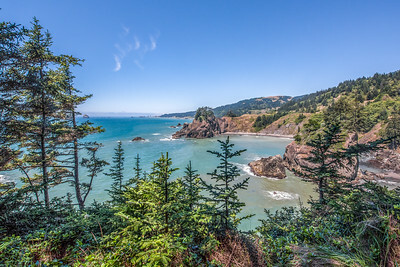 "Where The Forest Meets The Sea"
The forest meeting the sea at Otter Point, Oregon. Otter Cove. 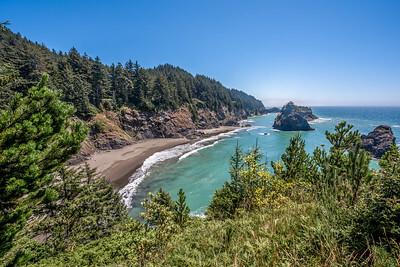 Otter Point, Oregon. "A Walk By The Sea"
Rocky spires at Bandon Beach. Western Gull at the Fisherman's Wharf Waterfront in Bandon, Oregon. 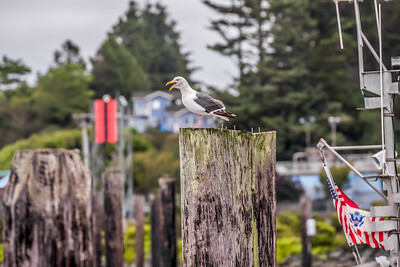 Western Gull taking a closer look at the Waterfront in Bandon, Oregon. 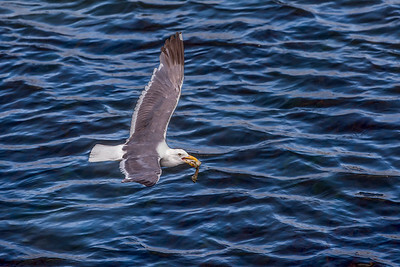 Western Gull makes off with some fresh fish scraps at the Fisherman's Wharf Waterfront in Bandon, Oregon. 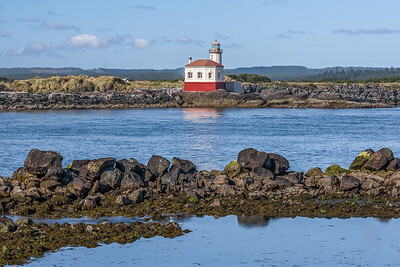 Coquille River Lighthouse across the Coquille River, Oregon. 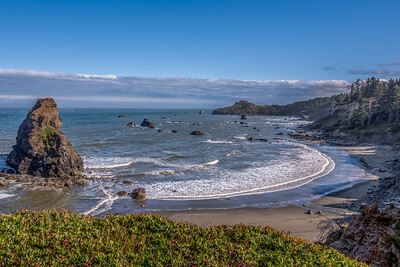 First lit on February 29, 1896, the light guided mariners past the dangerous shifting sandbars into the Coquille River and harbor at Bandon, Oregon. Open ocean behind the Coquille River Lighthouse, Oregon. 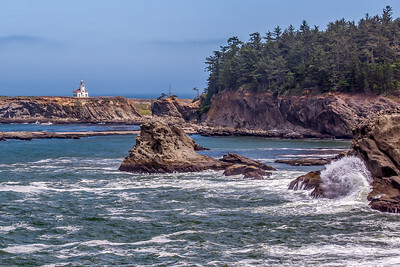 First lit on February 29, 1896, the light guided mariners past the dangerous shifting sandbars into the and harbor at Bandon, Oregon. Close up of the once needed Coquille River Lighthouse, Oregon. 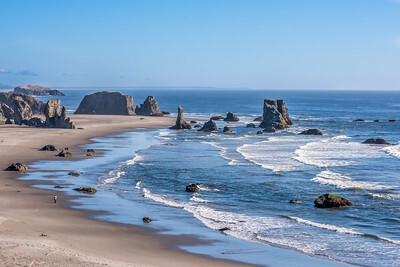 First lit on February 29, 1896, the light guided mariners past the dangerous shifting sandbars into the and harbor at Bandon, Oregon. 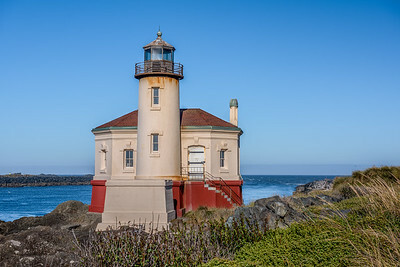 Coquille Light was shut down in 1939 and replaced by an automated light on the south jetty. 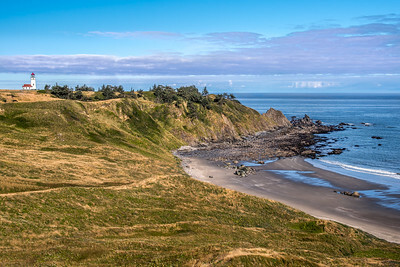 "Cape Blanco Lighthouse and Beach"
Cape Blanco Lighthouse overlooking the rocky shores of Cape Blanco, Oregon. First lit in 1870, it has a range of 23 nautical miles. 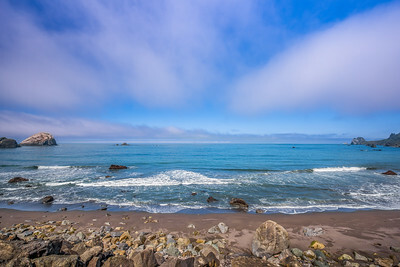 The rocky shores and driftwood beach of Cape Blanco, Oregon. Up close at the Cape Blanco Lighthouse, Oregon. This still operational light stands at 59 ft. First lit in 1870, it has a range of 23 nautical miles. 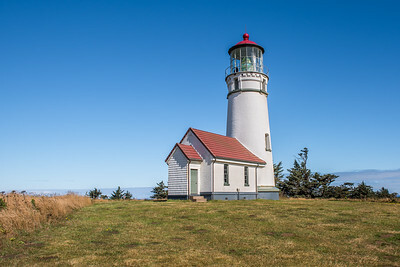 The 1871 Yaquina Bay Lighthouse. Now a privately maintained navigational aid for Newport Harbor. Newport, Oregon. The commercial fishing fleet at the end of the day. Newport, Oregon. 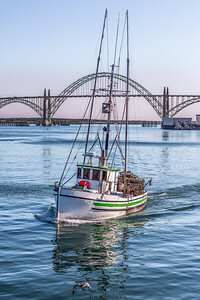 A fishing boat returns to Newport Harbor after a long day of crabbing. 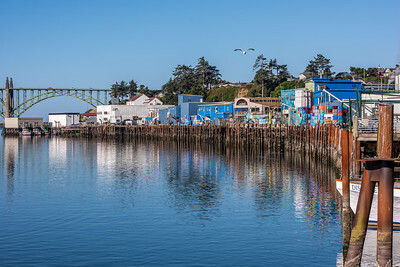 Newport, Oregon. "Daybreak At Yaquina Head Lighthouse"
Yaquina Head Lighthouse, Oregon. 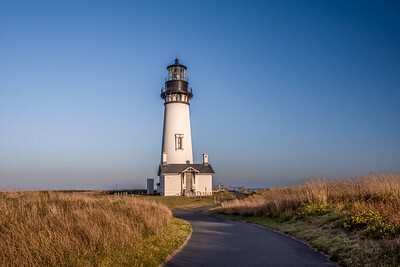 Made in Paris in 1868 and shipped to Oregon, Yaquina Head Light was first lit August 20, 1873 and was known early in its existence as the Cape Foulweather Lighthouse. 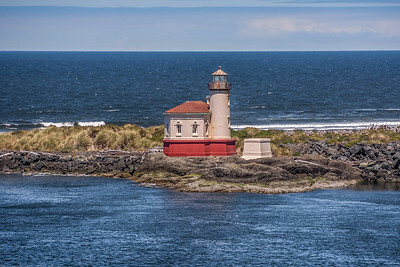 The tower stands 93 feet tall, and is the tallest lighthouse in Oregon.